Our goal is to grow endurance sports both in the individual and the community. We do this by providing athletes with personalized training programs tailored to their needs to help them achieve their highest potential at their target races. We feel this can be achieved by communicating with our athletes through written and hands on training programs. I have been competing in the sport of triathlon for ten years now and I have yet to see the guides get any credit or recognition for all that they do. They are the ones that make it possible, but nobody knows their name. In the stat sheets, it is as though they didn’t show up for the race. In my stat sheet they are the star performers. The sport of triathlon can become a very “me centered” sport until you experience it as a guide or a blind athlete. The sport then becomes a team sport. I put a lot of trust in my guide to make the best decisions for both of us. My guide must be accountable for the training and mental preparation required to stay with me the entire race. What do they get out of it? Well, if you’re thinking materialistically than nothing. My guides have sacrificed weekends from their family, personal finances, hours of their free time and the stress that great responsibility brings. All of this to help someone else become the best they can be in something they love. Their impact expands well beyond the sport of triathlon. My guides have been mentors and teachers. They have also been protectors. Most of the time they are heroes! My guides have helped me become better in the sport of triathlon but more importantly they have helped me become better at life! For this I want to honor them for all that they have done. A few of my guides deserve special recognition. These guides have become my “go to” people. They are the ones that I can always count on to get the job done. They have sacrificed the most for me and I think it is only fair that I give them special recognition. Todd Wiley has guided me in the fewest races with respect to the above two but demonstrates the character of someone that loves life. Todd was a former professional triathlete and now triathlon coach that sought out the opportunity to guide me. 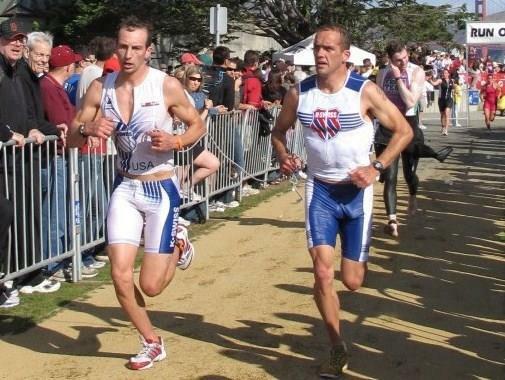 Todd has guided me in some of my biggest races including the New York City Triathlon two times, Escape from Alcatraz in 2009 and two 70.3 World titles. Todd has also been there to guide other blind athletes when a guide was needed at the last minute. He is so much fun to race with and helps bring out the inner kid inside me. Just like the two Matt’s (Matt West and Matt Miller), Todd exemplifies the person I want to become.